The man who broadcast Jackie Robinson’s first season with the Dodgers recalled that, as a boy in Sanford, Florida, “I saw black men tarred and feathered by the Ku Klux Klan and forced to walk the streets. I had grown up in a completely segregated world.” Red Barber confessed that when he learned the Dodgers would field a black player, his first reaction was to quit his job. Red's father, William Lanier Barber, was a locomotive engineer from Brown's Creek, North Carolina. His mother, Selena Martin, was an English teacher and school principal from an old Mississippi family. She insisted that her children practice what she taught. “My mother gave me an ear for language. . . . She gave me my interest in religion, too,” he wrote. “My father didn't have the education my mother did, but he was a wonderful raconteur, a natural storyteller. He'd sit out on the front porch and tell stories by the hour.” The Barbers later had a second son, William Martin, and a daughter, Effie Virginia. That led to a job with the station, WRUF, and to his first sports assignment: Florida's opening football game in 1930. He called his debut “undoubtedly the worst broadcast ever perpetrated on an innocent and unsuspecting radio audience.” He was so bad that he was pulled off the air and other announcers tried their hands at the next two games. During those weeks, Barber began attending football practice and picking the brains of an assistant coach. He learned how to prepare for a broadcast. He talked his boss into giving him another chance, and the sportscaster's career began. Barber encountered the other passion of his life in Gainesville: Lylah Murray Scarborough, a nurse who treated him when he was taken into the infirmary one night after an accident. They were married in 1931. On September 17, 1937, Red and Lylah's daughter, Sarah, was born. Sarah, their only child, later became a professor of English. Ambitious for a better job, Red took time off from WRUF and rode buses to Atlanta, Louisville, Cincinnati, and Chicago for auditions, but stations were not hiring during the Depression. In 1934 the Cincinnati Reds' new general manager, Larry MacPhail, persuaded owner Powel Crosley Jr. to put the team's games on the air. An executive at WLW, a station owned by Crosley, remembered the young man from Florida, and hired him as the club's first play-by-play announcer at $25 a week, less than he was paid in Gainesville. On Opening Day he broadcast the first major-league game he had ever seen. “That was the most joyous day of my life, next to my wedding day,” he remembered. In 1935 Red called the first of thirteen World Series, over the Mutual network. What he remembered most vividly was the pregame briefing by Commissioner Kenesaw Mountain Landis. Judge Landis summoned the announcers from all the networks (there were no exclusive rights deals then) and in his customary Sermon-on-the-Mount style, lectured them, “Don't editorialize. Report.” Landis's admonition was prompted by Ted Husing's 1934 Series broadcasts, when Husing criticized the umpires. Husing was banned from the Series forever after. Barber's best-known innovation for broadcasters was a simple device to remind him to repeat the score frequently for listeners who had just tuned in: He kept a three-minute egg timer, an hourglass, on his desk in the booth. Every time the sand ran down, he repeated the score and flipped his timer over. Dozens if not hundreds of later announcers adopted this prop. An important part of the early play-by-play man's job was the re-creation of out-of-town games. Broadcasters didn't begin traveling with teams until after World War II. The announcer in a studio hundreds of miles from the ballpark used Western Union's telegraphic pitch-by-pitch accounts to simulate a live broadcast. Most broadcasters tried to make the re-creation seem as realistic as possible: using sound effects of recorded crowd noise, cranking up the volume for an exciting play; two pieces of wood banged together to simulate the crack of the bat; recorded organ music. “My reaction was just the opposite. I wanted the audience to know at all times that I was doing a re-creation,” Barber said in a 1985 appearance on KCMO radio in Kansas City, Missouri. He used no sound effects and placed his microphone close to the telegraph key, so listeners heard the beeps of Morse code. When Larry MacPhail left Cincinnati for Brooklyn in 1939, he took Barber with him to the nation's media capital. Red brought the down-home idiom of his Southern roots to the borough whose residents were ridiculed for speaking of “dem” and “dose.” Many people who lived in Brooklyn in the 1940s have insisted that they could walk down any street in the borough and never miss a pitch, because Barber's voice was wafting out of every window and every passing car. During World War II, he became a civic institution as chairman of Brooklyn's Red Cross blood drive and host of radio War Bonds sales. New York offered Barber unmatched opportunities. According to the Pro Football Hall of Fame, he called the first National Football League championship game to be broadcast nationwide, in 1940, when the Chicago Bears buried the Washington Redskins, 73-0. He regularly broadcast football games of the professional Brooklyn Dodgers and New York Giants, as well as Princeton University. He also hosted entertainment programs with bandleaders Sammy Kaye and Woody Herman and singers Lena Horne and Mario Lanza. For nine years after World War II, he was the director of sports for CBS, where he first heard Fordham University student Vince Scully. Barber never admitted any racist feelings. In his history of Robinson's rookie year, 1947: When All Hell Broke Loose in Baseball, he declared, “I was not a racist.” He wrote in his autobiography, “The Negroes who came and went through our lives were always treated with the utmost respect and with a great deal of warmth and a great deal of affection.” At the same time, he acknowledged, “[T]here was a line drawn, and that was that.” Southerners of Barber's generation never encountered a black person in a situation of social or economic equality until they reached middle age. That was that. Edwards asked why he said that. Barber replied, “When you're doing something such as you and I are doing, live radio without any preparation, no script, you are just concentrating on your work and something just comes out. . . . When you realize that things suddenly come out of your subconscious or your unconscious when you're talking to an open microphone, sometimes it frightens you. More than thirty years later, a young broadcaster named Chris Berman on the upstart cable network ESPN adopted “back, back, back,” he said, as a tribute to Barber. “The bases are FOB -- they're full of Brooklyns”—he acknowledged he made up after seeing the term, which meant “free on board” in the shipping industry, and turning it over in his mind. His most enduring coinage was “sitting in the catbird seat.” In Barber's lexicon, that meant a batter with a three-ball, no-strike count or a team with a comfortable lead. In 1950 attorney Walter O'Malley bought Rickey's 25 percent interest in the Dodgers and took control of the franchise. Red’s relationship with the new owner was touchy. “O'Malley wanted to cut me down to size,” he wrote in his autobiography. “He is a devious man, about the most devious man I ever met.” Barber broadcast his thirteenth World Series in 1952, again sharing the NBC radio and television microphones with Mel Allen. It would be his last. Ever since the Gillette Company bought exclusive rights to the Series in 1939, Barber had chafed at the company’s cavalier treatment of announcers. By 1953 Gillette paid the broadcasters just $200 a game “for the biggest sports event on coast-to-coast television,” he fumed. Barber declined to broadcast the ’53 Series when the company refused to negotiate his fee. When Red told O'Malley what had happened, O'Malley's reply—“That's your problem”—ended Barber's relationship with the Dodgers. His contract for the Brooklyn broadcasts had expired, and the sponsors had made no move to renew it. A few days after he left the Dodgers, Red was hired by the Yankees. The new job was quite a comedown. For twenty years in Cincinnati and Brooklyn, he had been the principal broadcaster, handing out assignments to his assistants. He decided how many innings they would call, who would do which commercials, who would handle pregame and postgame shows. According to the University of Florida’s Smathers Library, where Red's papers are housed, he broadcast play-by-play on thirteen World Series, four baseball All-Star Games, five Army-Navy games, one Sugar Bowl, two Rose Bowls, eight Orange Bowls, and four National Football League championship games. That career was over. At age fifty-eight Barber began what he called his retirement at his home in Key Biscayne, Florida, near Miami. But it was an active retirement. He wrote a syndicated newspaper column and four books, and did sportscasts for Miami radio and TV stations. Cable television impresario Ted Turner hired Barber and Mel Allen to call the 1978 Little League World Series, one of the most bizarre anachronisms in broadcasting history. That same year, he and Allen—forever linked—became the first broadcasters honored by the National Baseball Hall of Fame. They received the Ford C. Frick Award for “major contributions to baseball,” an award named for the commissioner Barber despised. Red would take one more star turn on a national stage, introducing himself to a generation of listeners who knew only the Los Angeles Dodgers and who, if they followed baseball at all, followed it primarily on television. In 1981 he joined National Public Radio’s Morning Edition as a regular commentator, appearing for four minutes every Friday at 7:35 a.m. Eastern time. The host of Morning Edition, Bob Edwards, lovingly captured those years in Fridays With Red published after Barber's death. The Barbers had left the fast-growing Miami area for the smaller city of Tallahassee, where Lylah had attended Florida State College for Women, the predecessor of Florida State University. Tallahassee station WFSU-FM ran an audio line to their home, and Red broadcast from a desk in his office. Nominally the spot was a sports commentary. In reality, it was a free-form conversation about just about anything, often including his flower garden and the adventures of his cats. He talked about opera, quoted Victor Hugo and Kahlil Gibran, and delivered condensed versions of some of the sermons he had preached as a lay reader in the Episcopal Church. In the 1980s Lylah developed Alzheimer’s disease, and much of the rest of Red’s life was devoted to caring for her. “By the time I met him in the early ‘80s, he was so frail it seemed a gust of wind might take him away,” Edwards wrote. Barber had suffered various physical ailments since the 1940s, going deaf in his left ear and surviving a heart attack and surgery for ulcers that removed much of his stomach. On October 8, 1992, he begged off the next day's broadcast, blaming a sore throat. On that Friday he drove himself and Lylah to a hospital. He underwent emergency surgery for an intestinal blockage and fell into a coma. 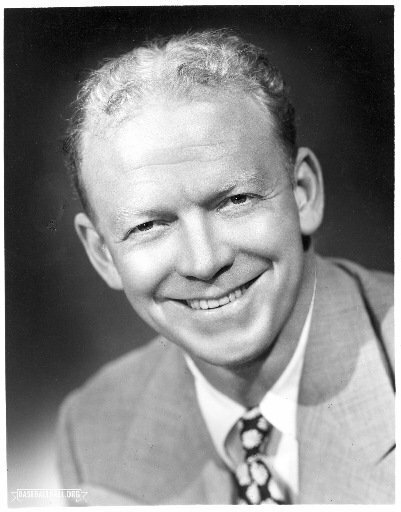 Red Barber died at eighty-four on October 22, 1992, at the Tallahassee Memorial Regional Medical Center. The New York Times reported that the cause of death was pneumonia and other complications from surgery. His ashes were buried in his yard, beneath five camellias. In his Morning Edition tribute, Bob Edwards said, “One of the great voices of America will speak to us no more, and the camellias will never smell as sweet.” Red would not have liked that; camellias have no scent. In Sanford, Florida, where Red grew up, a municipal park bears his name. In Tallahassee, where he lived his last years, Florida State University's Center for Public Broadcasting sits at 1600 Red Barber Plaza. His alma mater, the University of Florida, annually awards the Red Barber Radio Scholarship—$700 to a junior or senior majoring in telecommunications, with a preference to students planning to pursue careers in sports broadcasting. In Los Angeles Red's heir, Vin Scully, continued into the twenty-first century as the voice of the Dodgers. Barber, Red, with Robert Creamer. Rhubarb in the Catbird Seat. Garden City, New York: Doubleday & Company, 1968. Barber, Red, Show Me the Way to Go Home. Philadelphia: The Westminster Press, 1971. Barber, Red, Walk in the Spirit. New York: The Dial Press, 1969. Barber, Red. 1947: When All Hell Broke Loose in Baseball.Garden City, New York: Doubleday & Company, 1982. Barber, Lylah, Lylah. Chapel Hill, North Carolina: Algonquin Books of Chapel Hill, 1985. Edwards, Bob. Fridays With Red.New York: Simon & Schuster, 1993. Smith, Curt. The Storytellers . New York: Macmillan, 1995. Smith, Curt. Voices of the Game. South Bend, IN: Diamond Communications Inc., 1987. Los Angeles Times, August 6, 2002. From the Catbird Seat: Red Barber, a 1993 radio documentary written and produced by Greg Rhodes for public station WVXU in Cincinnati. It included excerpts from his play-by-play broadcasts and his later interviews.